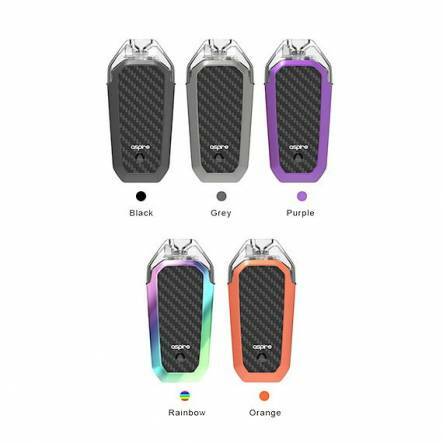 Aspire AVP is the latest starter kit by Aspire with an all-in-one pod system. The kit features a compact design that provides powerful hits. What’s more, the design offers premium feel when using it. There are noticeable improvements on the exterior of this device as well as internal mechanism. Unlike the previous plastic models, the AVP presents a carbon fiber and metal construction which makes it sturdier and heavier. It fits comfortably in the hand for discrete vaping and in the pocket to use on the go. In addition, it comes in different colors (Black, grey, orange and purple) for you to choose one according to your style. The Aspire AVP is equipped with an integral 700mAh battery that provides the whole day vaping. It features a MicroUSB port and comes with a charger for recharging when the battery dies. Furthermore, the battery presents multiple protections for safety while using and charging the device. This is a draw activated pod system supporting 8W, 10 and 12 wattage settings. There is one button that allows you to navigate smoothly through all the wattage outputs. On the button is an LED light indicator that shows the status of the battery. It comes with a cartridge that can hold a capacity of 2ml of juice and a pre-installed 1.2ohm Nichrome coil for both e-juice and nicotine salts. The design of this device is very catchy and futuristic. It is compact and feels great in hand.